My Life in Scrap by luvmykids: Guess who's coming out of Retirement! Guess who's coming out of Retirement! Creations By Rachael and she has some guest spots for the month of August. I'm a full-time mom to two little kids. 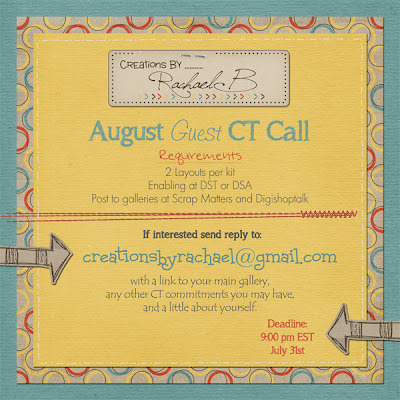 As a Guest CT member, I receive free digital scrapbooking products in return for posting my layouts in the digital community. A list of the current creative teams I'm guesting for can be found above in the 'Proudly Guesting For' section.